Q: What do you get if you cross a flamingo with a peacock? NEEDLES: 3.5mm - which is smaller than the pattern. I've had this pattern in my favourites for some time, but the garter stitch put me off making it. After the success of last week's Hitchhiker (which had lots of lovely comments at Unravel and when out & about at the weekend from non-knitters too) I reconsidered and am glad I did. I'm itching to get on with it but alas D has been away this week and BOTH children have been struck down with a headache/sickness bug that seems to be making its way through our village at breakneck speed. Thankfully I've had my mum here *gives thanks to the Mother-gods* to do everything else that I can't do while comforting/wiping/cuddling the little ones, but I haven't managed to get very much knitting done! Sitting up for the last 2 nights, I've finally managed to finish Look at Me by Jennifer Egan. I really liked certain parts of the novel - especially the initial set-up chapters - and considering it was released just before 9/11 it's an interesting read (one of the characters is a 'terrorist' in NY). The main theme of identity is both interesting and thought-provoking, but I did find the middle section to be wordy and cumbersome. It's a long book and 75% of the way through, reading it felt like a chore and then had an ending which felt quite rushed - which is a shame as Jennifer Egan can obviously write very well. I'd be interested to read her later, more well known novel, A Visit From The Goon Squad. After that, and for a bit of light relief, I started reading Remix at 3am yesterday and am already 80% done - it's a far-fetched whodunnit involving impossibly goooood looking (did you read that in the voice of Zoolander?) people, a supposedly dead rock star, and rocking horses. It's just what the doctor ordered! Later today I'll be randomly selecting the winner of the Blogiversary Giveaway Part 2 - which you can find here - I'll leave it open this afternoon to give the folks from WIP Wednesday and Yarn Along a chance to enter, and will make the draw tonight (I'll close the comments before I make the draw). I am absolutely itching to make something for myself and this looks soooooo lovely!! flaming peacock....what can I say but NOM NOM Delish!! :D Great pattern - and very easy!!!!! Your Spectra is gorgeous! I love the colors. So pretty, especially in that combination of yarns. Hopefully the flu-bugs move along as quickly as they came! I'm normally not a fan of pink but I love the hot pink!! It's so awesome!! I love pink but don't wear it much - this could all be about to change! So beautiful, the color change is gorgeous. Hope you feel better soon! Thanks Sarah. I'm loving the colour changes too. What bright and lovely yarn. I hate when books are like that. I resent reading them, but have to see how they finish. Wow! It is Beyond gorgeous! I wish I was knitting that right now, I feel like those colors could definitely work as happy-inducers. That was my feeling too - it's a bit bright, but just feels right! Glad you like it. It feels so exciting to look at the start of your Spectra! 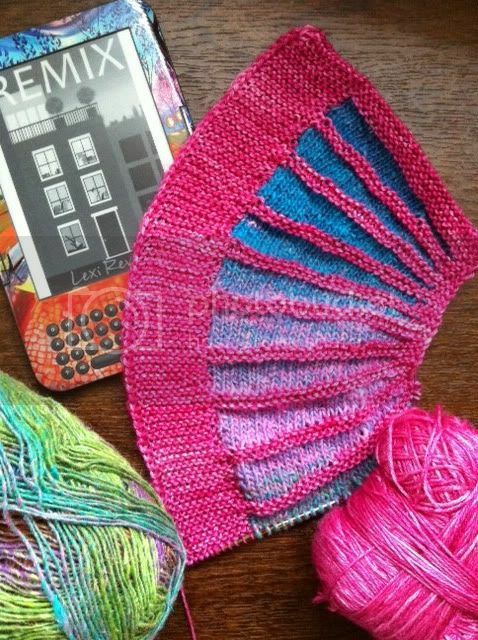 How do you find time to knit and read? Sorry your babes are ill. The bugs are nasty this year and unforgiving. How are you feeling now? are you fully back to full health? That looks fab. What amazing colours you've chosen. Wow! A shock of color! Just what we need for springtime.